Juan C Álvarez-díaz1*, Diego Ospina-Zapata1, W. Rojas2, M. A Quijano-Abril1. Demographic expansion in America over the last decades generated a negative impact in the Andean highland forests and species of the Podocarpaceae family. In Colombia, six species of this family have been recorded for the Andes belonging to three principal genera: Podocarpus, Prumnopitys and Retrophyllun. One the most endangered species is Podocarpus oleifolius, because the industry attractiveness. The central Andes Mountains constitutes a fragmented forest landscape and populations of P. oleifolius have been severely reduced. We hypothesized that forest fragmentation in the Andean Mountains joined with the individuals selective cutting, have been contributed to the lost of individuals and also to the loss of genetic diversity guiding an inbreeding effect in the populations of P. oleifolius. We characterized the genetic diversity of P. oleifolius and assayed five microsatellites markers previously published in 10 central Andes native populations. This allowed to us to assess the genetic diversity pattern among populations of P. oleifolius by measuring the H-W equilibrium, allele richness, genetic distances by FST and population structure. We found evidence of the negative impact of the forest fragmentation in this species, such a homogenous population and observed heterozygosity excess, suggested as a consequence of the selective surviving. We hope these results could be helpful for the development of better conservations programs. Keywords: Podocarpus, Population genetics, Diversity, Conservation. Las poblaciones nativas de la familia Podocarpaceae en los Andes colombianos han sido severamente reducidas debido a la intensa explotación forestal. En este estudio reportamos el estado de la diversidad genética de las poblaciones nativas de la especie Podocarpus oleifolius en El estudio fue realizado la cual es una de las especies más afectadas de esta familia. 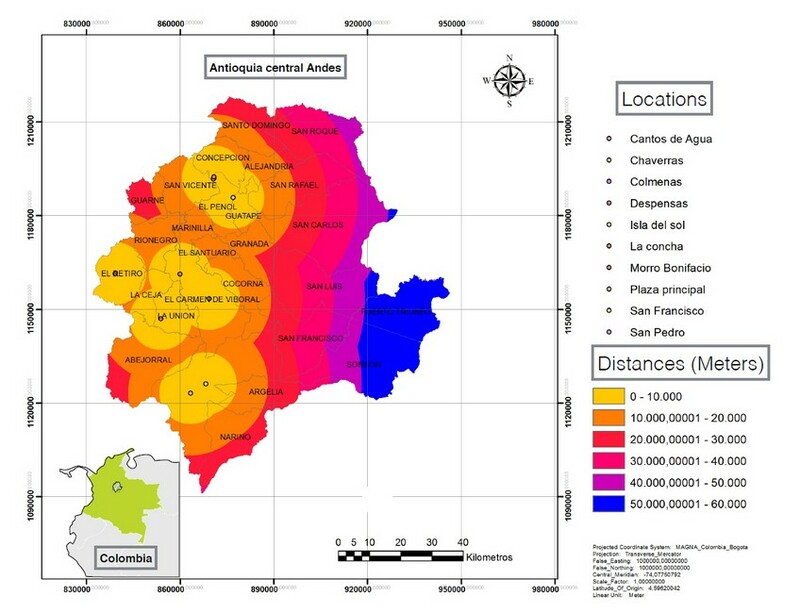 en diez localidades de la cordillera central Andina en la región de Antioquia. Nuestros resultados exponen que las poblaciones remanentes presentan aislamiento genético y bajo números de individuos. Este estudio sugiere además que la intensiva explotación forestal de este especie ha tenido efectos negativos en la diversidad genética de P. oleifolius en los Andes Colombianos. The Podocarpaceae gymnosperm family is composed by 18 genera distributed from Central America to South America 1,2. Nevertheless, the demographic expansion over the last decades has induced to a negative impact in the Andean highland forests, with a species richness decreases in America 3. In Colombia, six species of this family have been recorded for the Andes and belongs to three principal genera: Podocarpus, Prumnopitys andRetrophyllun 4. Forest fragmentation and wood exploitation reduced dramatically the Andean population’s richness 5. For the last fifty years Podocarpus oleifolius have been one the most Andean exploited species, mainly because of their industry attractiveness 6, these caused a severe overexploitation for the last century; yielding a reduction of the original population size 7. In Colombia P. oleifolius is considered a threatened species and is reported as vulnerable category in the Alexander Von Humboldt Institute list 8. P. oleifolius is distributed over the fragmented forests from southern Mexico to the northern Bolivia with an altitudinal distribution between 1800 and 3300 m. In Colombia is widely distributed in the Andean highland forest with an altitudinal range of 2000 to 3200 m, a rainfall ranges from 1000 to 4000 mm per year and a temperature range of 12°C to 18°C. In the Andean Mountains some studies about the ecology and the potential trade of P. oleifolius have been reported, however is very limited the knowledge about the population genetic characteristics. Populations genetics studies about of the dispersed Andean species are scarce but some researches have roughly measured the genetic drift and some basic population structures, mainly based on phenotypic traits with a biodiversity management and conservation purposes 9. In Colombia some researchers studied the phenology and ecology of P. oleifolius for their forest industry importance, some studies and propagation protocols were subsequently published 4,10. Although all the Colombian pines species have been exploited as wood resources, the species distributed along the central Andes mountains are the majority P. oleifolius, Prumnopitys montana and Retrophyllun rospigliosii 11. Mostly in the Antioquia region, the Andean forest is fragmented and thereby the natural populations of P. oleifolius have been severely reduced. Some studies reported the distribution and dominance of the natural population in different Colombian regions (Nariño, Cauca, Valle, Quindío, Risaralda and Antioquia) 10. This results revealed that in the central Andean mountains preserves some residuary and isolated populations, been a perfect model to research the genetic structure of isolated populations of trees. Regard to the above, current performed studies in the Universidad Católica de Oriente in association with the Environment regional authorities, we located and recorded the remaining natural populations of P. oleifolius 12. Nevertheless the genetic research in the Colombian Andes for conservation porpoises still incipient, probably because of the rugged geography and social issues associated to the conflict. The above, lead us to hypothesize that the Andean Mountains forest fragmentation combined with a selective cutting of individuals, have been contributed not to the loss of individuals but for the genetic diversity lost, guiding a inbreeding effect in the relict Andean mountains populations of P. oleifolius. Our study is one of the few reports that document the effect of the intensive exploitation on the inbreeding and the genetic diversity of a Colombian endemic and threatened tree species. Our main goal was to characterize the genetic diversity of P. oleifolius in the central Andes Mountains. We assayed in 10 native populations with five microsatellites previously published for P. nakaii 13. Subsequently we used this data to assess the patter of genetic diversity among populations of P. oleifolius. Our goals were to assess the allele diversity, identify the genetic population structure and to establish the inbreeding level. Finally, we hope that this data become a useful conservation strategy tool for P. oleifolius in Colombia. Study site: This research was carried out in the central Andes Mountains in Colombia. We sampled a native forest located at 10 places in seven municipalities at the Antioquia department. The ecosystem is characterized for the forest patches landscape, which is interrupted by small municipalities with economical farming activities. The geography is also characterized by a rough mountainous topology with only a few endemics relict’s forests. The average elevation is over the 2000 m and temperature range varies from 10°C to 28°C with an annual rainfall ranges from 1600 to 3500 mm 14. Sample collections and DNA isolation: We used 67 individuals of P. oleifolius in 10 different locations distributed in seven municipalities of the central Andes. Fresh leaf tissue was acquired in the field, kept and conserved in silica gel for laboratory processing. All samples were recorded with a voucher sample and we assigned an ID according with the HUCO herbarium codification. We made a DNA extraction from all samples using a cetyltrimethylammonium bromide (CTAB) protocol 15 and verified by a 1.5 % agarose electrophoresis. DNA amplification and genotyping: We evaluated eight microsatellites in Podocarpus, previously reported by Chiang in 2011 13. 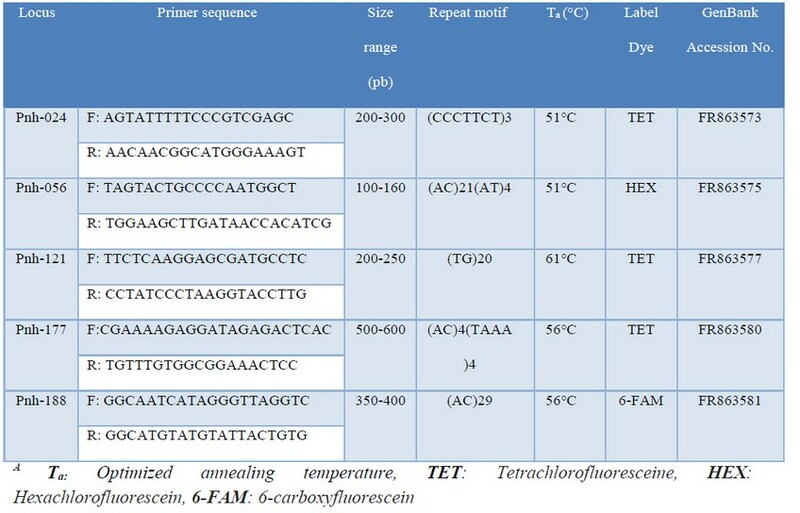 Afterward the optimal temperature was calculated by a PCR gradient using a 96-well T100 Thermal cycler (Biorad) with a temperature range from 50°C to 65°C. PCR was performed with 25 μl of reaction mixture containing 20 ng of template DNA, 0.2 μg of reverse and forward primers, 2.5 μl of 1X NH4 Reaction buffer (16mM (NH4)2SO4, 67mM Tris-HCl (pH 8.8 at 25°C and stabilizer) (Bioline) and 1 U of BiolaseTM DNA polymerase (Bioline). The PCR program was set at 94°C for 5 min, followed by 35 cycles of 94°C for 30 s, a temperature ranges from 50 to 65°C for 30 s, 72°C for 30 s and a final extension of 72°C for 10 min. Amplicons were checked by 1.7% agarose electrophoresis. Positive amplifications were amplified under the same conditions but using forward fluorescent dyes labeled primers (Table1). Capillary fragment electrophoresis of PCR products was scored against an internal size standard (GeneScanTM- 600 LIZ®) on an ABI 3130 genetic analyzer, and genotype data was scored using a gene Mapper 5.0 software (Aplied Biosystems, CA, USA). 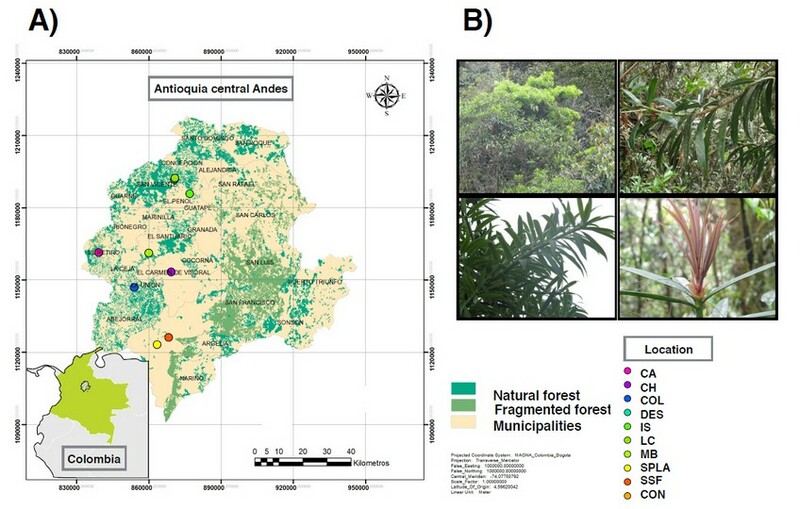 Statistical analysis: To analyze the Podocarpus population genetic diversity in the central Andes Mountains, we used data from five polymorphic microsatellites alleles from different geographic populations located in 10-conserved endemic forest patches. We tested the linkage disequilibrium (LD) between a pairs of loci in each population with a Fisher’s exact test in the Arlequin 3.5 software, we also made the Standard diversity indices for each and the total populations 16. Standard indices included: observed and expected heterozygosity; mean alleles number, allelic richness. We did not excluded null alleles because the small sample, which is due the rarity of tree species in endemic forests. In order to investigate the P. oleifolius population structure in the eastern Antioquia, we calculated all the pairwise FST and a standardarized measure G’’ST for all pair of populations using the Genodive version 2.0b23 software 17. We used Bonferroni correction for the test, involving multiple comparisons. Comparing the geographic locations and the genetic structure patterns, we investigate the genetic structure by a Bayesian inference implemented in STRUCTURE version 2.3.2 18. The number of populations (structures, K) was set to 1 to 10. Optimal number of groups was determined using 20.000 cycles of bur-in period and 60.000 Monte Carlo Chains using as prior information the geographical population composition and an Admixture model, assuming correlation between alleles frequencies in populations. K simulations for each value were repeated 10 times to provide stable and safe estimates probabilities. The optimal number of groups was determined using the Evanno method 19. Molecular variance analysis (AMOVA) was calculated with the Arlequin software version 2.5 16. Diversity index were calculated as the average values of standard indices for genetic diversity using the Alrequin 3.5 software 20-23. We also investigated the spatial genetic structure by isolation. We calculated a pairwise matrix using geographical distances in kilometers between the 10 populations sampled. We also calculated the genetic isolation by distance using a Mantel test 24, employing in the Genodive software with 10.000 permutations. We carried out our analysis using a previously genetic distances matrix with FST, calculated in Genodive and grouped by blocks. Allele frequencies graphics were made in the Prism-GraphPad software, version 5 (PrismGraphPad, USA). In order to establish the P. oleifolius population composition in the central Andean forest in Antioquia, we sampled individuals from 10 places located at seven municipalities. According to the previous reports of the Universidad Católica de Oriente Herbarium (Rionegro, Colombia), P. oleifolius could be found in small populations in some endemic forest patches throughout the region. 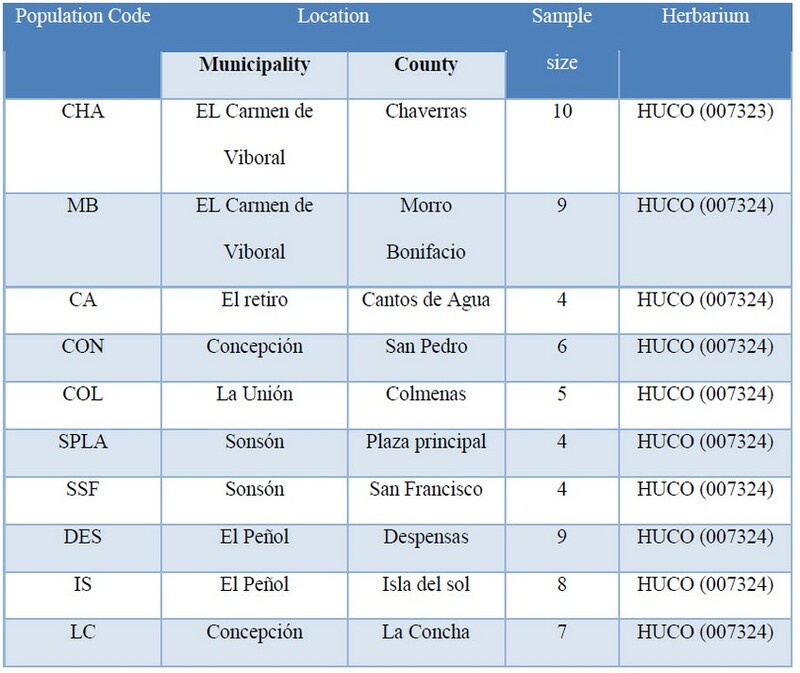 Sampled municipalities and their coordinates locations were coded and consigned at the herbarium HUCO (Table 1). In ArcGis 25, we made a map of the Antioquia central Andes region and the P. oleifolius population distribution. The map shows 10 locations across seven municipalities representing the study area, along with information of the forest coverage in the Central Andes Mountains. This is an evidence of the fragmented forest composition (Fig. 1A). We show some examples of the collected specimens (fig. 1B). Fig.1. Map showing P. oleifolius population range distribution across ten sampled municipalities in the central Andes. (A) The map shows in green the natural forest patches and the fragmented ones. (B) Representative photos of foliar material collected and sampled trees of P. oleifolius. Supplemental figure 1. Map showing P. oleifolius population range distribution across the Antioquia central Andean municipalities and counties. The color represents the distances in meters according to the table (right). We sampled for genotyping 67 individuals of P. oleifolius from 10 populations across the central Andean forests. We used five polymorphic locus reported in P. nakaii. We consigned the primer sequences, the microsatellite motive repeats and the optimized conditions for PCR amplification (Table 2). We identified 24 alleles in five microsatellite loci and all the assessed microsatellites were polymorphic. In order to assess the population genetics, we measured the Hardy Weinberg equilibrium, the observed and the expected heterozygosity. 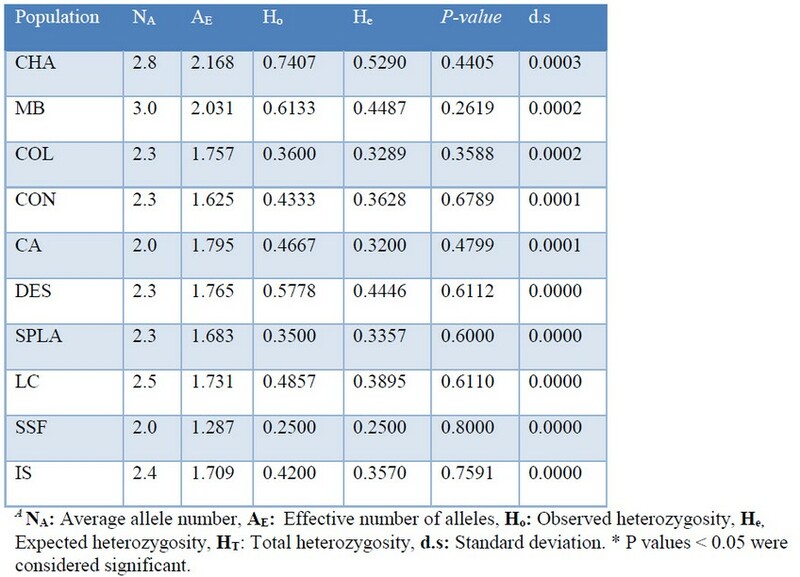 All the assessed populations, except the SSF population, showed heterozygosity excess and all the populations did not present H-W equilibrium (Table 3). These results, contrary to our first hypothesis evidence no inbreeding but a selective survival of the individuals related with the heterozygosity excess. Nevertheless, these results have to be looked carefully because of the small number of individuals and the small effective number of reproductive ones. In order to analyze the allelic richness, we calculated the total alleles number per locus, finding that although in the five loci, there are some representative alleles, and also have some rare alleles in some individuals. The number of alleles per Locus were: Pnh 024 = 4, Pnh 056 = 3, Pnh 177 = 2 and Pnh 188= 6 (Fig. 2). Subsequently, we evaluate the allelic diversity calculating the standard and the molecular allelic diversity. Calculated standard diversity gave us values ranged from 0.3125 to 0.7778 for the Ho and values ranged from 0.3125 to 0.5595 for the He. We also calculated the average diversity, finding values ranged from 0.0000 to 0.6601 for the average diversity with high standard deviations values, possibly due to the low number of individuals (Table 4). Although the diversity values were variable, the CA and IS populations shown not molecular diversity, indicating a complete homogeneity. Fig. 2. Alleles frequencies on assayed loci. Allele count of each microsatellite over sampled populations. A) Pnh 121, B) Pnh 056, C) Pnh 121, D) Pnh 177 and E) Pnh 188. Genetic differentiation of the P. oleifolius populations were calculated using the FST and G’’ST estimates. These data were consigned in a matrix showing low differences between tree populations (Table 5). Most of the pairwise comparison shown none difference between populations, indicating a very homogeneous genetic structure. Highest FST values observed were between populations CA-COL (FST = 0.1789) and CA-SPLA (FST = 0.1764). Highest G’’ST values were between populations CHA-LC (FST = 0.1640) and CHA-SSF (FST = 0.1764). Distance isolation was assessed calculating a Mantel test, but the results were not significant, indicating that there are not a genetic differences caused by geographic isolation (data not shown). In order to assess the possible genetic population structures, we calculated the population assignment with the STRUCTRE software. We obtained the structure analysis results with the delta K criterion using 1 to 10 possible groups and admixture model assumption (Fig. 3). Bayesian clustering suggested the presence of four groups, according to the Evanno method, but all the individuals have a mixed ancestry. We consistently got the same population structure after 10 independent times. Fig. 3. Plots of theoretical populations of 66 individuals of genotyped P. oleifolius trees with five nuclear microsatellites loci and for K=4. Each line represents a single tree and the colors represent the probabilities to be assigned to one of the four simulated population. Black lines indicate the division between original population groups. Populations are: CHA (1), MB (2), COL (3), CON (4), CA (5), DES (6), SPLA (7), LC (8), SSF (9) and IC (10). Forestall exploitation of P. oleifolius in Colombia: In Colombia the central Andes mountains landscape is composed of vegetal coverage patches such as forest, in which just a minority remain like endemics relicts. Throughout the colonization, many of the native forest species were displaced because of the foreign gymnosperm planting and other non-endemic species, employed mainly for building activities. P. oleifolius is one of the six native gymnosperms species in Colombia and is in a threat category. This species was exploited intensively in the second middle of the twenty century, due to their high wood quality, causing a dramatically reduction on the natural populations because of the absence of an appropriate reforestation program. So, native forest fragmentation into the disconnected patches, the continuous individual selection for wood uses and the tree dioic trait, it has leaded it to a dramatic reduction of P. oleifolius. Because the industrial uses, some researches have been financed in order to study the phenology and ecology for conservation purposes 5 These investigations resulted in the elaboration of propagation protocols for native populations restoration and expansion, but nowadays the genetic structure is unknown 9. Regardless of the conservation efforts, because of the demographic expansion and the unknown genetic aspects of P. oleifolius, this species is threatened and also included in the IUCN red list 26. Genetic diversity: The current study represents the first attempts to characterize the genetic diversity of an endemic gymnosperm in Colombia, distributed across the central Andes forest. We characterized the genetic diversity of 10 populations of P. oleifolius distributed along seven municipalities in the Antioquia central Andes forests. Due to the small numbers of specimens in the native forest, population genetic studies implied some problems but represent an exclusive chance to observe the bottleneck effect on the allelic richness. Andean mountains patches and the disconnected forest structure may be considered analog to an island isolation system for trees species. Hence of the small number of populations, and its dioeciously reproduction, firstly we assumed a low allelic richness diversity. Contrary to our first hypothesis we observed and heterozygosity excess and none H-W equilibrium (Table 3). We also found high values of standard diversity indices, which were ranged from 0.3125 to 0.7778 for the Ho and from 0.3125 to 0.5595 for the He (Table 4). For average diversity, the values were very variable; we found values from 0.0000 to 0.6601. Data supports the effect of the tree selective cutting and the selective survival of a particular phenotype. The last agrees with field reports, which suggest that most of the observed trees remnants have twisted and short trunks. Regarding to the effective alleles number, we found low effective alleles in all fragments, reflecting a population dynamic with a poor genetic flow. This suggests that exist a negative isolation effect caused by a drastic reduction in the number of individuals in a population with some characteristics such as sexual reproduction, which is aggravated by a restricted distribution range. Based on modern research and the Global plan of action for Conservation, one of the most important aims is to achieve a sustainable use and manage of the forest genetic resources 27. According to the last, we argue that to establish a genetic structure of threated species like P. oleifolius, will be a valuable approach for new conservation programs. 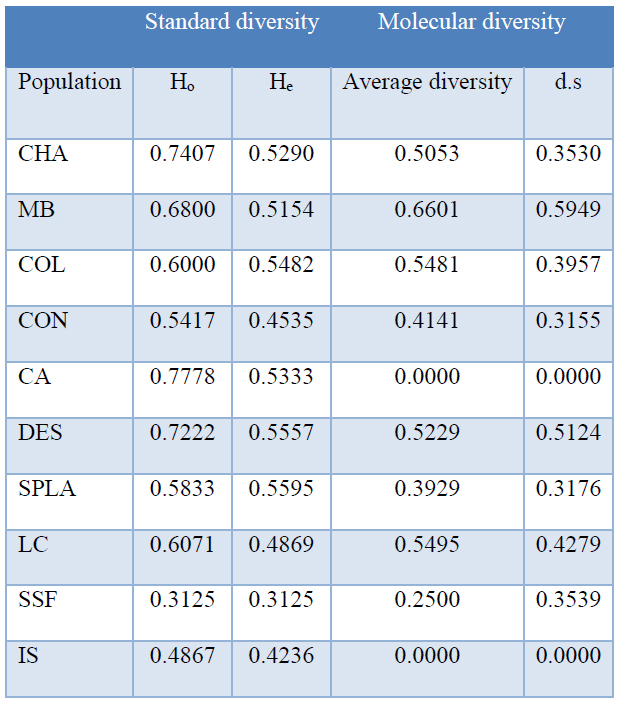 In order to draft the population structure o P. oleifolius in the Antioquia central Andes, we calculated the FST and G’’ST estimates, which showed null or moderate differences, except for the CHA and MB population, which are the most isolated and also the less disturbed populations (Table 5). Although we calculated a Mantel test, these showed not significant results for genetics differences associated to a geographic isolation (data not shown). Finally, we tried to model a draft of the population structure employing the STRUCTURE software. The last go along with the results of the genetic pairwise distances. Again the CHA and MB populations showed moderate differences beside to the other populations. According to the Evanno test, the most feasible number of genetic cluster was four groups. Although our genetic analysis did not show an evident isolation, which showed low genetic diversity between fragments and a homogeneous structure, which may not be associated to a geographic isolation, but probably due to the anthropogenic conflicts guided by the selection of some particular phenotypes. Phenotypes under selection and concerns for conservations programs: Farming development and the consequent forest fragmentation had enabled a reduction of the suitable habitat for P. oleifolius. Wood exploitation not only has reduced the population size but also the genetic diversity. Considering our results, we hypothesize that the massive forestall exploiting was liable for the abrupt population decrease, which consequently constituted a bottleneck. We found in the central Andes forest; that just small populations remain conserved. In rare species like P. oleifolius not only exist a small number of individuals but also a smaller number of effective alleles, risking the species fitness and even their survival. A classic population genetics paper published by Nei 28 explained that a bottleneck may not have a necessary reduction in the alleles richness, this is true just if the population reproduction rate is enough to compensate the allelic loss by genetic drift 28. Otherwise P. oleifolius is a gymnosperm species where its reproduction rate is slow, implying that the bottleneck effect and the subsequent genetic drift might have a drastic and negative effect in the allele richness. We found that some common alleles are in the majority of the populations, but moreover exist some rare alleles that are exclusive for certain populations, which reflect the variable allelic diversity between sampled populations (Table 4). Typically, the outcrossing breeding offset the effects of genetic drifts and geographic isolation preventing allelic loss. Our sampled populations showed an excess of heterozygosity compared with the expected. These indicated that not all the population had low levels of genetic diversity as we firstly thought. Finally, with the aim to make a genetic draft structure of those populations, we calculated the FST value, which gave us an idea of the population genetic distances. We did not found correlation between geographic and genetic distances using the Mantel test, but we found that most of the populations were extremely genetically similar. According to most of the population genetic indices, this kind of results, showed highly similar values of FST concomitant with heterozygosity excess, suggesting a selective individuals survival. This is in accord with field observations, indicating that because the species wood interest in the region, particular phenotypes have been selected and the less attractive are left. Asses the genetic consequences of the forest fragmentation in Colombia, should become a major relevant topic in the framework on climate change. For this reason, characterize the genetic diversity in such threatened native species like P. oleifolius, not only is important but also imperative. Results constitute to our knowledge, one of the firsts researches that provide evidence of the allelic richness and genetic population structure of P. oleifolius in Colombia. Particularly in species with small populations, it is crucial to assess the genetic fitness reduction consequences and the inbreeding effect, that will be helpful to generate effective conservation strategies and sustainable management of the genetic resources 29. Regarding this, some expert’s researches advise that the introduction of foreign individuals in order to increase the allelic richness in the most homogeneous populations might be a way to mitigate the inbreeding negative effect. This research provides evidence of the negative impact in the forest fragmentation, mainly for important Colombian native tree species. We hope this data become a useful conservation strategy tool for the development of better conservation programs. We thank to Dirección de Investigación y Desarrollo from the Universidad Católica de Oriente for fund and support this research. Also we want to thank to research group of Molecular Genetics (GENMOL) from the Universidad de Antioquia for providing advice and technical resources during the development if this research. The authors declare to have no conflict of interest. 4. Torres-Romero J. Podocarpaceae. Flora de Colombia, Monografía N° 5. 1988. p. 73. 5. Marin V A. Ecología y silvicultura de las podocarpáceas andinas de Colombia. Smurfit Cartón de Colombia; 1998. 6. Vélez MA. Ecología y Silvicultura de las Podocarpáceas Andinas de Colombia. Smur t Cartón de Colombia S.A.; 1998. 7. Cogollo A, Velasquez C, Toro JL, Garcia N. Las magnoliaceas, las miristicáceas y las podocarpáceas. 2007. 189-226 p.
8. García N. Las magnoliáceas, las miristicáceas y las podocarpáceas. IAVH, editor. Instituto Alexander von Humboldt; 2007. 9. Rojas A. Pinos Colombianos : Rev el mueble y la madera. 2009;18–25. 10. Marin V A. Observaciones fenológicas y propagación sexual de tres especies de Podocarpaceae de la zona Andina Colombiana. Cali; 1995. 11. Calderón-Saenz E. Libro Rojo de plantas de colombia. Libro rojo de plantas de Colombia. Volumen 6. Orquídeas, Primera parte. Serie Libros Rojos de Especies Amenazadas de Colombia. 2006. 828 p.
12. Gomez S MC, Rodriguez M SL, Quijano A MA. Programa integral de conservación y recuperación para las especies Podocarpus oleifolius, Godoya antioquensis y Cariniana pyriformis en áreas del bosque montano bajo y bosque húmedo tropical del oriente antioqueño. 2009. 13. Chiang YC, Shih HC, Chang LW, Li WR, Lin HY, Ju LP. Isolation of 16 polymorphic microsatellite markers from an endangered and endemic species, podocarpus nakaii (podocarpaceae). Am J Bot. 2011;98(11):14–7. 14. Alzate F, Idarrága Á, Díaz O, Rodríguez W. Flora de los bosques montanos de Medellín. 2013. p12 p.
16. Excoffier L, Lischer HEL. Arlequin suite ver 3.5: A new series of programs to perform population genetics analyses under Linux and Windows. Mol Ecol Resour. 2010;10:564–7. 17. Meirmans PG, Van Tienderen PH. GENOTYPE and GENODIVE: two programs for the analysis of genetic diversity of asexual organisms. Mol Ecol Notes. 2004;4:792–4. 19. Earl, Dent A. and vonHoldt BM. STRUCTURE HARVESTER: a website and program for visualizing STRUCTURE output and implementing the Evanno method. Conserv Genet Resour. 2012;4(2):359–61. 20. Ewens WJ. The Sampling Theory of Selectively Neutral Alleles. Theor Popul Biol. 1972;3:87–112. 21. Nei M. Molecular Evolutionary Genetics. Tempe AZ Arizona State University. 1987. 22. Tajima F. Measurement of DNA polymorphism. Mech Mol Evol. 1993;37–59. 23. Zouros E. Mutation rates, population sizes and amounts of electrophoretic variation of enzyme loci in natural populations. Genetics. 1979;92(23):623–46. 25. ESRI. ArcGIS Desktop: Release 10. Redlands, CA: Environmental Systems Research Institute. ; 2011. 26. IUCN. The IUCN Red List of Threatened Species. Version 2015-3. The IUCN Red List of Threatened Species. Version 2015-4. 2015. 27. FAO. Global plan of action for the conservation, sustainable use and development of forest genetic resources. 2014. 29. Newton AC, Allnutt TR, Gillies ACM, Lowe AJ, Ennos RA. Molecular phylogeography, intraspecific variation and the conservation of tree species. Trends in Ecology and Evolution. 1999. Universidad Católica de Oriente, Sector 3, cra. 46 No. 40B 50, Rionegro, Colombia. 2Grupo de Genética Molecular (GENMOL), Instituto de Biología.